A 2012 book called From the Ground Up: Innovative Green Homes, edited by Peggy Tully, documents a 2008 design competition of the same name. Competition entrants were asked to envision affordable, green single-family houses for the Near Westside neighborhood of Syracuse, New York. Seven finalists were selected from the more than 50 entries received, and three of the finalists' designs were realized. 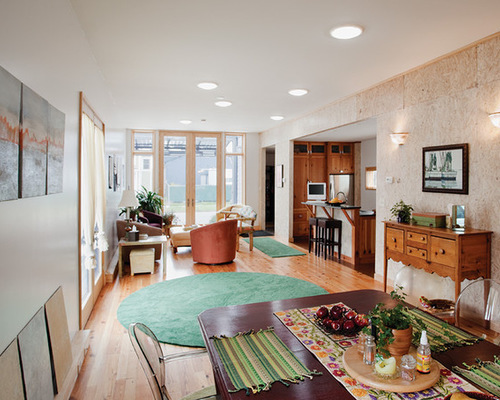 This ideabook focuses on those three houses, which are 1,100 square feet and $150,000 each, and the lessons they offer about green residential architecture. Photo credit Princeton Architectural Press, original photo on Houzz. The competition targeted the Near Westside neighborhood of Syracuse for more reasons than proximity to Syracuse University. As Mark Robbins, dean of the university's School of Architecture, describes it, the "From the Ground Up competition seeks to provide another model for disinvested urban residential neighborhoods found throughout the United States through the creation of affordable green homes." Yet, as can be seen, and as Michael Sorkin picks up on in his essay in the book, the winning houses are highly individual forms that have a scale similar to existing houses in the neighborhood but stand out strongly from them. That's interesting: The home is built to stringent Passive House standards. 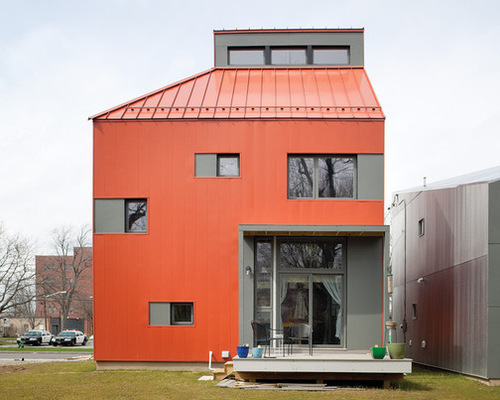 The R-House (shown next to the orange TED House, coming next) takes its name from "R-value," a unit of thermal resistance that measures the thickness of the material divided by its thermal conductivity. This is an apt moniker, considering how the architects designed the house to meet Germany's Passivhaus (Passive House) principles: It has airtight, superinsulated exteriors with minimal thermal bridging, highly insulated windows and heat-recovery ventilators. Following Passive House principles, the architects made the resulting exterior envelope 16 inches thick, with a value of R-70. From inside to outside, there's 2x6 wood framing (2x12 framing at the roof) with blown-in fiberglass insulation (drywall is mounted on the interior face of the studs, plywood on the exterior side), then EPS (foam) insulation, and finally corrugated metal siding mounted on furring strips. Uniquely, instead of using wood studs, the walls and roof are framed with truss joists (TJI members) that are normally used as beams. Triple-glazed windows with argon filling are the last ingredient in creating a superinsulated exterior. Windows are minimized, such that joints between window and wall assemblies are reduced. 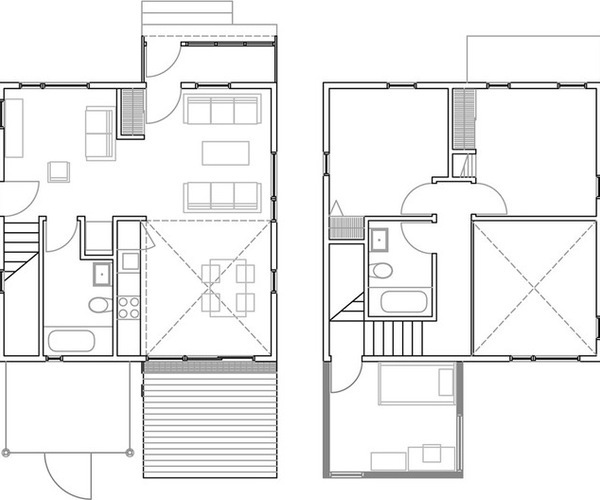 The windows are also located to take advantage of the sun (south is up on the floor plan, for reference, so the street elevation faces north), bringing as much light as possible into the double-height space that comprises almost half the house. The architects boast that "a single mechanical unit ... quietly circulates air throughout the house," thereby reducing "electrical consumption by approximately 70 percent compared to the typical Syracuse home." The team then made fixes toward gaining Passive House certification—to date, only 52 projects in the U.S. are certified, and only two in New York state. 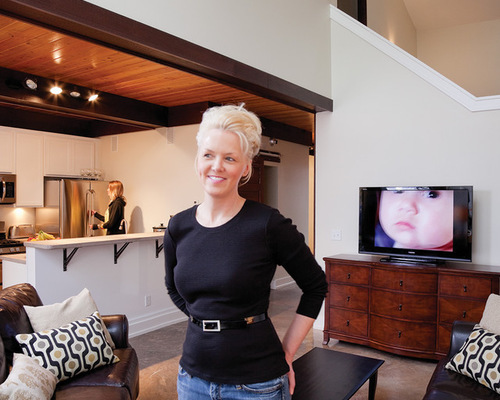 The two-bedroom, two-bath house was bought by Maggie Maurer (shown here) and her boyfriend Peter Waack. Maurer, a mother of three, is actually a Building Performance Institute–certified building analyst, meaning she is living in one of the best examples of what she devotes her working hours to. 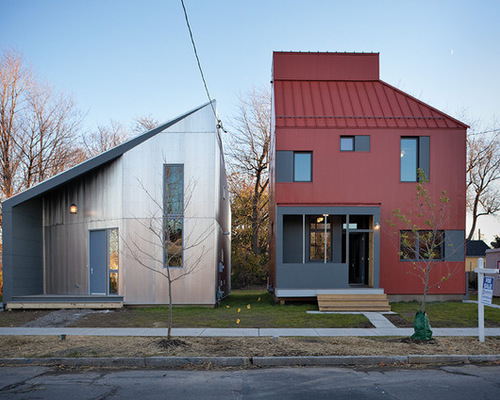 That's interesting: Onion Flats won the competition, then completely redesigned the house after taking a Passive House certification training course. Like the R-House next door, the TED House is designed per Passive House standards, but that did not happen until after Onion Flats won the competition, right before the project was going in for permits, in fact. As the architects put it, "After our Passive House training, we were embarrassed by such a wimpy shell" of R-19 in the walls and R-30 in the roof. They changed from batt insulation and R-1 windows to closed-cell spray foam, densely packed cellulose, a zip-panel air barrier, 4-inch EPS insulation, a metal panel rain screen and R-10 windows. While the cost for the shell went up over their competition entry, it resulted in reduced mechanical needs. Or, as they describe it, "TED has the equivalent of a fur coat, rather than a windbreaker, standing between it and the harsh Syracuse winter." This keeps out the cold but also keeps the heat in, requiring very little heat to be generated. The floor plans illustrate one way that Onion Flats sees the house being added to—a bedroom off the stair could turn the two-bedroom, two-bath into a three-bedroom house. As the photo above attests, the house is striking for the dramatic three-story space that extends from the kitchen to the loft below the solar chimney that caps the house. Warm air and humidity are exhausted at the top of the house, taking care of the interior's cooling needs in the summer. Steven Morris and Sara O'Mahoney, who own a bicycle shop in the city, purchased the house with the help of Home HeadQuarters, a housing provider that gave them down payment assistance and tax incentives. They say their house is "cheaper than our apartment was—and it's a thousand times nicer." Note the trays above the kitchen doors, where the couple is growing some food through the help of the glass transom. That's interesting: The home is envisioned as a mixed-use model for incorporating work into urban and suburban houses. While a lot of modern and contemporary residential architecture is criticized for not appearing homelike, the architects of the Live/Work/Home made the conscious decision to design a house that could be mistaken for a commercial building. In their decision to integrate work into the residential program, they hope to, as they say, "attract new residents and uses, helping to repopulate the urban neighborhood." The retractable front screen can maintain privacy and filter sunlight, but it could also serve as a means of signaling when the work portion is open for business. Rather than combining parcels, as done on similar projects, the architects worked with one lot, meaning that the resulting single-story plan is a linear one. They found inspiration in vernacular longhouses, specifically the Haudenosaunee one in the Syracuse area. An external corridor extends from the front porch (previous photo) to the back porch. 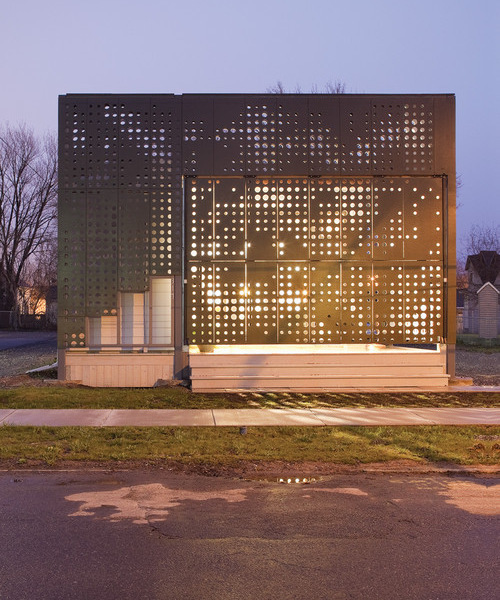 Hinged panels, perforated in tree-like patterns like the front facade, can be opened and closed to let in light and maintain privacy. 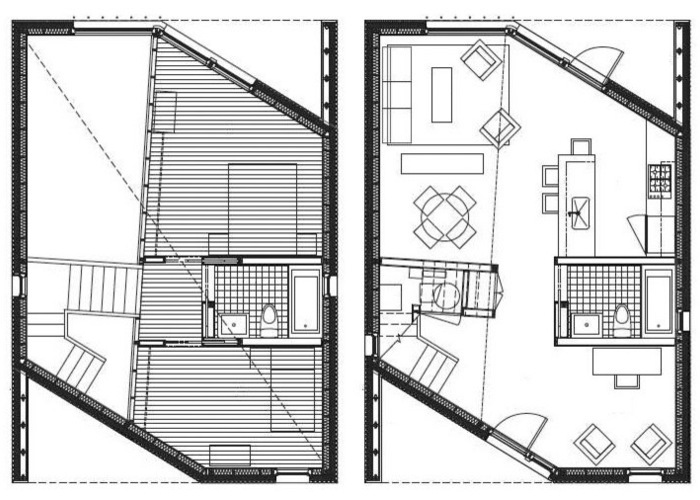 The plan is described by the architects as a loft, such that the main open space could be opened up entirely or, as is shown here, partitioned with casework for bedrooms. Keeping with the $150,000 budget, the house is finished simply. A wall faced in oriented strand board separates the loft space from the service areas—storage, kitchen, bathroom, laundry. Additional natural light enters the house through solar tubes. Their orientation across the ceiling echoes the perforated panels of the exterior. The exterior walls behind the perforated walls are made from structurally insulated panels that combine with the insulated glass and reflective roofing to create an efficient envelope, if not as tight or superinsulated as the other two houses. The flexible zone at the back of the loft is accommodated by sliding panels that also echo the exterior perforated screen. Note the tracks on the floor and the ceiling that allow for as much area to be open or closed as the owners want. John and Kathy Miranda are semiretired. 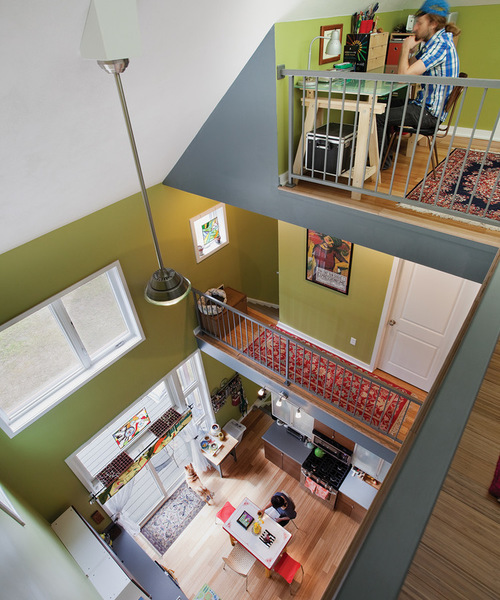 They bought the Live/Work/Home after living in an apartment in downtown Syracuse and love its design. In addition to the three houses discussed here, the handsome book—part of the New City Books series—presents the other four finalists, and it includes essays by Mark Robbins and Michael Sorkin, mentioned earlier, and by architectural historian Susan Henderson. What is most valuable about the book is the way it extends from the competition in 2008 to the recent occupancy of the houses; it doesn't limit itself to one aspect of the process. This big-picture presentation goes hand in hand with the big idea of realizing houses from a design competition whose timing coincided with the housing crisis and the doubt it created.